The month of July was a battle for the Giants. They had the positive vibes of the All Star Game, but were a team that still hadn't fully found their identity. The Giants finished July with a 12-12 record, but it was a struggle the whole way. They lost 5 of 6 on the first of two eastern road trips in D.C. and Pittsburgh. In the other road trip the Giants took the first 2 from both Philly and Atlanta and lost the 3rd game to not complete the sweep. July ended and August began with the home team going 3-7 at AT&T Park. It was a constant fight with the Dodgers and looked like it would be for the rest of the season. That's when Brian Sabean, Bruce Bochy, and PED's changed the course of history. The Offense was in danger of falling back in to scrape and claw mode. Not enough runners were getting on and not enough balls were dropping when the Giants needed. On July 28th Marco Scutaro was acquired from the Rockies for a Minor Leaguer. Ryan Theriot had been struggling and more was needed from the position. Blanco was not an every day right fielder and Nate Schierholtz was unhappy with his role on the club. Sabean shipped Schierholtz and 2 Minor Leaguers to Philadelphia for the awkward moving Hunter Pence. The Pence deal was the blockbuster, but the Scutaro deal turned out to be the gem. There were 3 key moments in the month of August that sent the Giants on their way to a division title. The first was on August 3rd when for the first time Bruce Bochy batted Pagan and Scutaro at the top of the order. 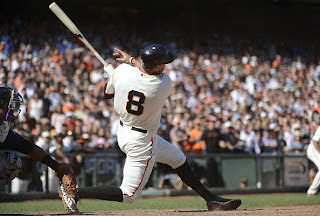 The second was a Sunday afternoon against the Rockies in which Hunter Pence hit the go ahead 3 run HR in the 8th and became a Giant that day. Finally, was when Melky got nailed for using PED's and Bochy found his favorite lineup on August 17th in San Diego. On August 15th Melky Cabrera was suspended 50 games for using a banned substance. His impact on the Giants lineup had been great. He was leading the league in hitting at the time of his suspension. On the day of the suspension the Giants lost to the Nationals 6-4. They had the next day off. That Friday August 17th was the beginning of some of the best baseball we have ever seen. Instead of packing it in, the team decided to rally together and play for each other. For the first time Bruce Bochy used the lineup of Pagan, Scutaro, Panda, Buster, Pence, Belt, Blanco, Crawford, Pitcher. It was the core that would carry this team to a division title and more. The team seemed to spring to life starting with that 10-1 victory in San Diego with the new lineup. The Giants had a winning percentage of .547 with Melky Cabrera, after he was gone they went 30-15 for a .667 winning percentage. 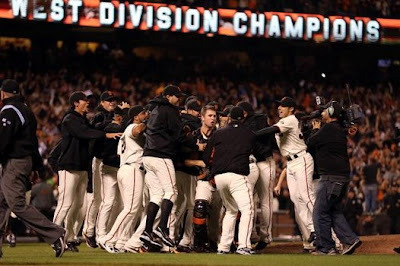 In fact the Giants went 25-10 in the 35 games between Melky's suspension and clinching the division. Pagan and Scutaro were the spark plugs at the top of the order. From Aug. 17th on they scored a combined 71 runs. Scutaro made contact with everything and batted .381 down the stretch while only striking out 10 times. Panda drove in 29 runs in those games and Buster solidified his MVP status by moving everyone on the bases home. 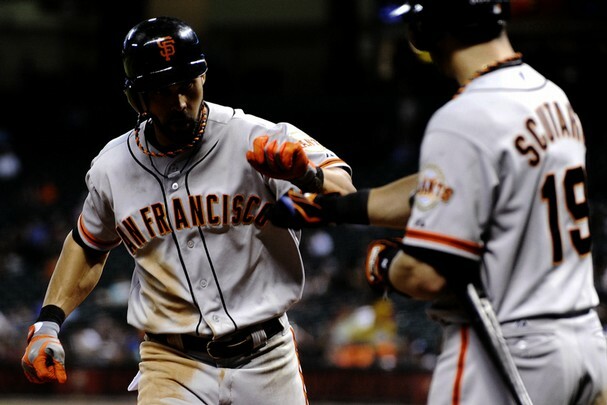 Buster batted .336 in his first full season in the majors. The pitching staff was just as good as the Offense. Vogey and MadBum seemed to struggle the most towards the end of the year. Timmy had problems but was 4-2 late in the year and Zito won 9 straight starts. The bullpen was no slouch either. Sergio Romo stepped in to the closer's role with 9 saves and only 3 runs in 19 innings. 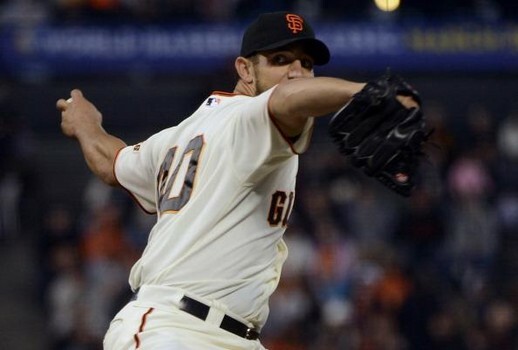 The trio of Affeldt, Lopez, and Casilla matched up with any hitters in late game moments. And George Kontos proved he had a little bit of stuff. The Giants came together as a team. On August 25th the Dodgers made one last desperate trade to catch the Giants. It didn't work. The Giants stepped on the gas and closed the season strong. Madison Bumgarner had been struggling down the stretch. He seemed to lose a bit of his confidence and at the same time, his control. But on the night of September 22nd, with a chance to clinch on the line, MadBum was closer to his old self. The Padres scored a first inning run on a steal and an error. Then the Offense continued what it had been doing by scoring runs. Posey and Pence both had sacrifice flies in the 1st, Bumgarner helped himself with a run scoring single in the 2nd and Scutaro drove in two in the 5th to make it 5-1 Giants after 5 innings. By then it was a matter of letting the bullpen go to work and keep scoring. By the end of the night the Giants had won 8-4. On a Saturday night in late September they became the NL West champions for the 2nd time in 3 years. On the day that Melky Cabrera was suspended the Giants were 64-54, one game behind the Dodgers. When they clinched the West on September 22nd, the Giants were 11 games ahead of second place Los Angeles. Sabean put the parts in place, and Bochy put them in the best position to win. 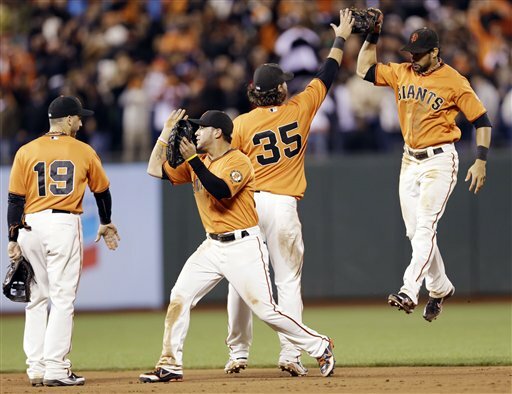 The Giants seemed to typify what the word "team" meant. We just didn't see how fine tuned they were until October.